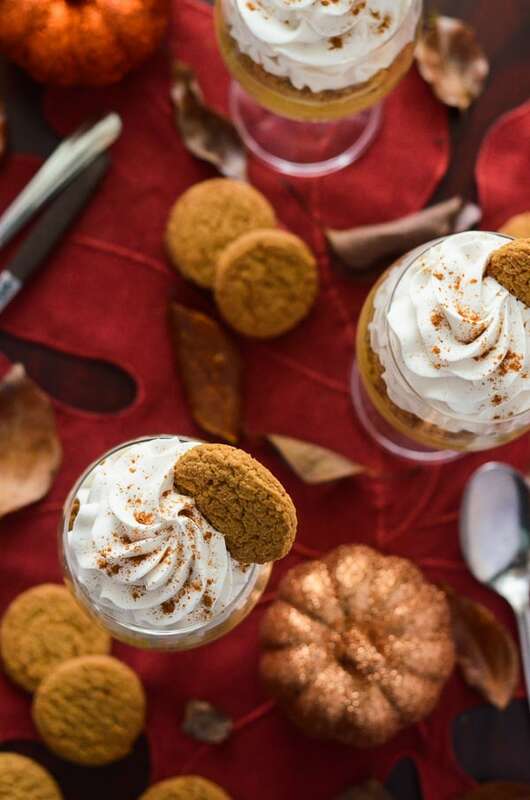 Pumpkin Pie Pots de Creme: fall’s favorite flavor, mixed up in a classic French dessert, and topped with crushed gingersnaps and a Maple Cinnamon Whipped Cream! So…are you all pumpkin-ed out, yet? I have to admit…after today? I may need to take a hiatus from pumpkin, myself. Only a couple of days, mind you. Let’s not get crazy. Today was Pumpkinfest at work, which is an annual event where lovely baking-type people bring in their favorite pumpkin-flavored baked goods. Cookies, cupcakes and muffins, breads and rolls, even a cheesecake. It was a bit like the Halloween feast seen in Harry Potter. I’m pretty sure I at least tried everything in the room, and somehow managed a to keep the pumpkin coma away. 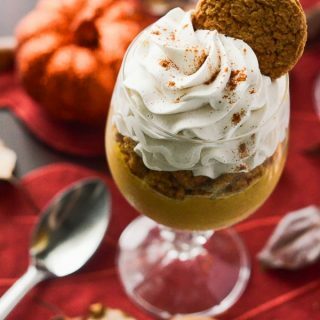 I tried to save room for a few bites of this delicious Pumpkin Pie Pots de Creme…but you guys are going to have to eat it for me. Welcome to #PumpkinWeek day 5! 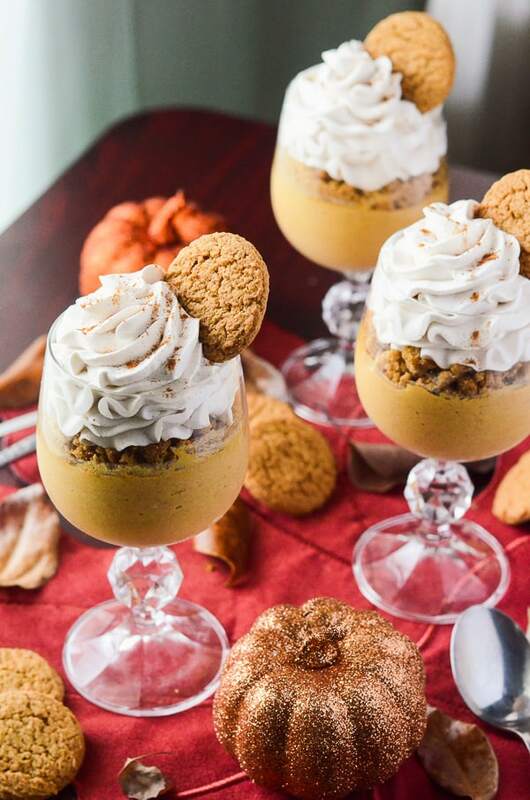 Hosted by Terri from Love and Confections, 19 Bloggers will be sharing 65 pumpkin-filled recipes over the course of the week. Be sure to come back every day to see all the delicious creations – from muffins to cakes, cocktails, breakfast baked goods, savory pastas and stews, and gluten-free recipes too. 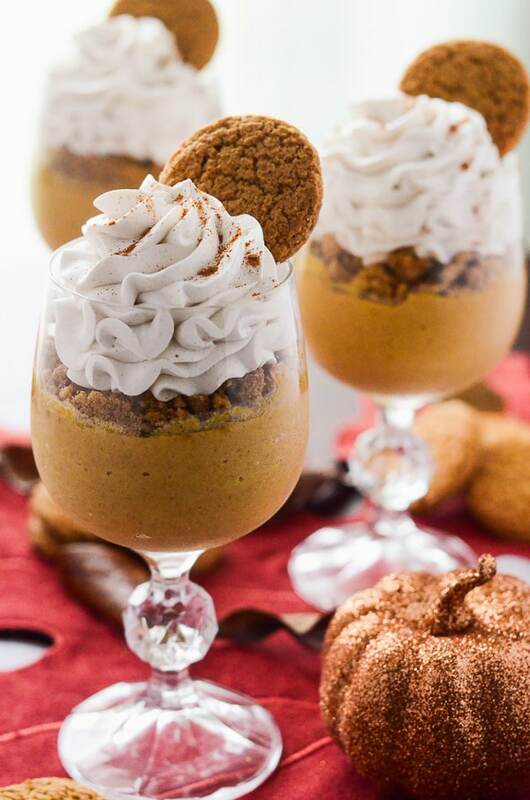 You can also find these great recipes and more on Love and Confections’ #PumpkinWeek Pinterest Board! I know, I know…it just looks like pudding. Or a boring, uninspired trifle. I promise that it’s so much more than that, though! Dating back to 17th century France, and literally translated to “pots of custard,” a pot de creme is essentially a boiled, tempered, then (water-bath) baked loose dessert custard. It’s everything good about flan and custard and pudding all in one, and then refrigerated and served with even more cream. How’s that for some fall gluttony? 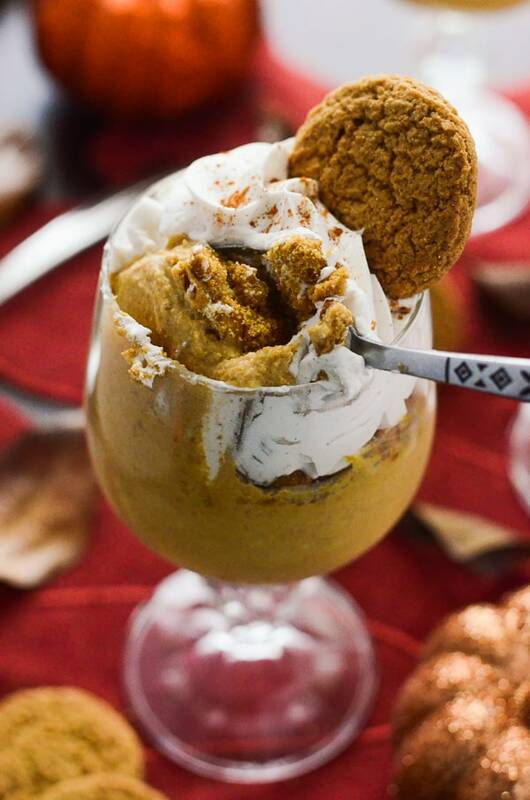 It’s most popular as a chocolate dessert, but the season, again, called for pumpkin. Quite a tough job, but someone has to do it, right? The great thing about these pots de creme is that there’s no baking involved! This is one of the easiest way to make this dessert, and while it’s not the traditional way, the shortcuts make it no less luscious and rich. 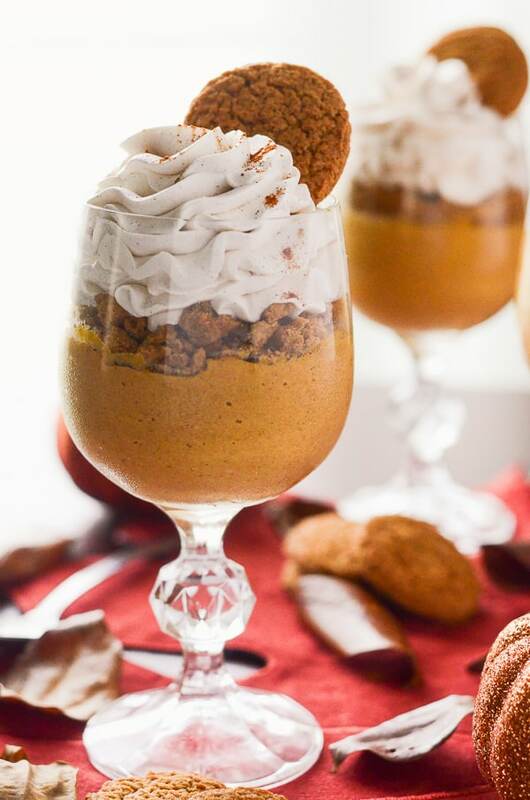 And to kick up the fall flavors a notch, I worked in gingersnaps and maple cinnamon whipped cream, and turned this already perfect dessert into a completely different thing. It’s also a deconstructed pumpkin pie! So I suppose…in the end, I did end up sharing a pie recipe after all. You have to admit, though…this is waaaaay prettier than a slab of pie, right? 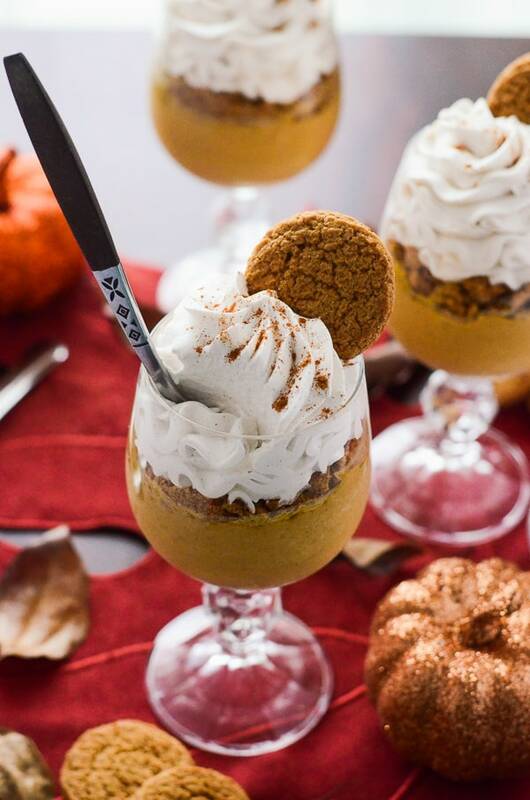 Fall's favorite flavor, mixed up in a classic French dessert, and topped with crushed gingersnaps and a Maple Cinnamon Whipped Cream! In a saucepan, bring cream and sugar to a boil over medium heat. In a heatproof bowl, whisk yolks. Add ¼ cup of hot cream to eggs, and whisk to temper; then whisk in the remaining cream ¼ cup at a time. Return to saucepan and cook on medium heat 1-3 minutes until thickened. Remove from heat. Place cream mixture, pumpkin puree, spices, salt, and vanilla in a blender (or use an immersion blender) and blend until smooth. Run mixture through a strainer over a bowl. Portion custard into bowls or glasses, and refrigerate for 2+ hours until set. When ready to serve, top with crushed gingersnap cookies. Combine heavy cream, maple syrup, and cinnamon in a bowl. Beat with a hand mixer (whip attachment) until medium peaks form. Spoon into piping bag and pipe on top of gingersnaps. Garnish with cinnamon and a gingersnap, serve, and enjoy! 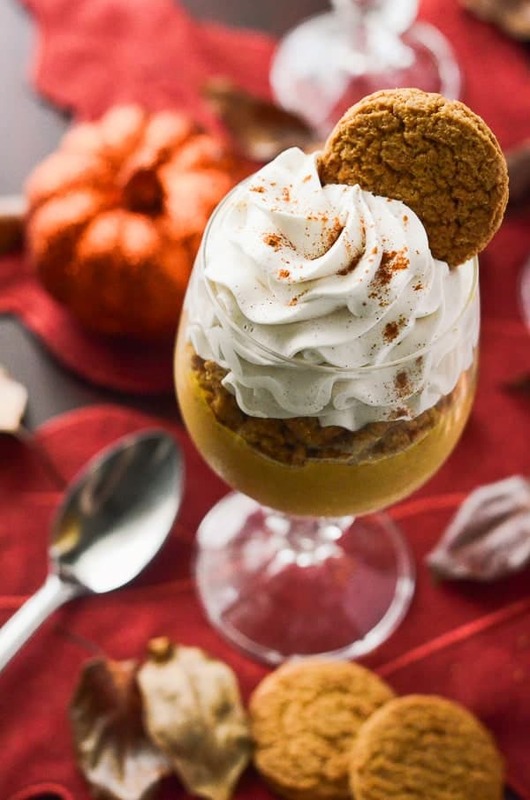 Are you a pumpkin pie traditionalist, or do you enjoy the flavor in other desserts? Pumpkin Week has been a blast!! I’m sorry to see it go…but I’m already planning for next year! Until 2016!! The photography on your site really is beautiful. I love the depth you have on the swirls of whipped cream. I feel like I could dive right in! Lots of inspiration here – I may have to do a #PumpkinWeek of my own! I made these last year for Thanksgiving and I’m making them again this year! However, instead of topping them with whipped cream I am taking advantage of the unused egg whites and making meringue!